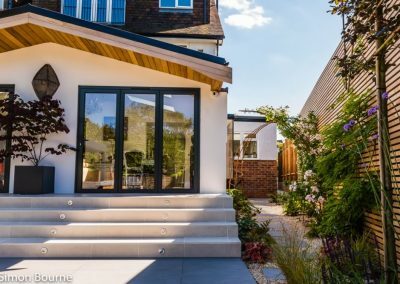 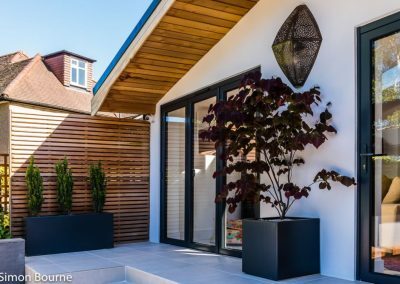 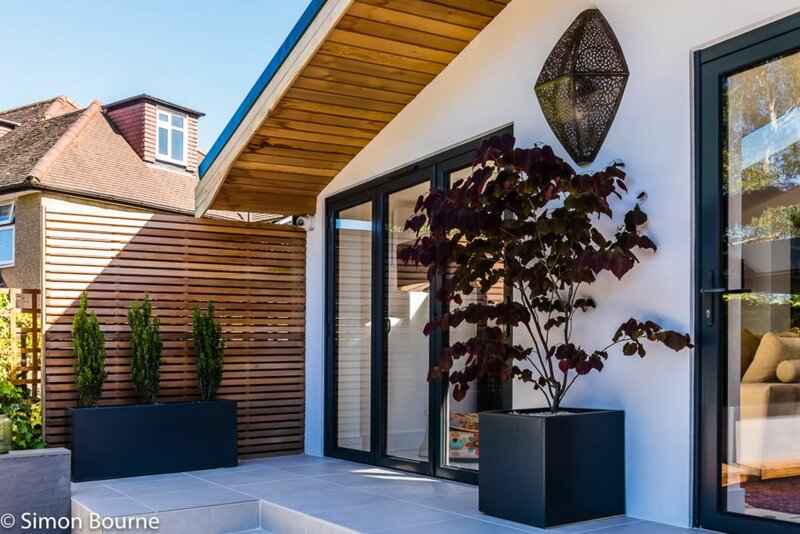 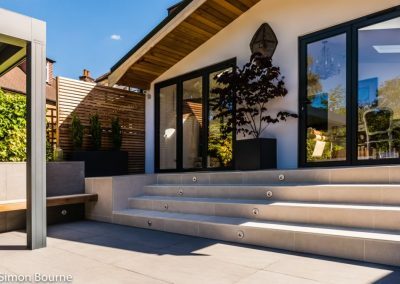 I was commissioned to design both the front and back gardens of this semi detached house in Whetstone, London N20, as part of a team for the house renovation and extension works. 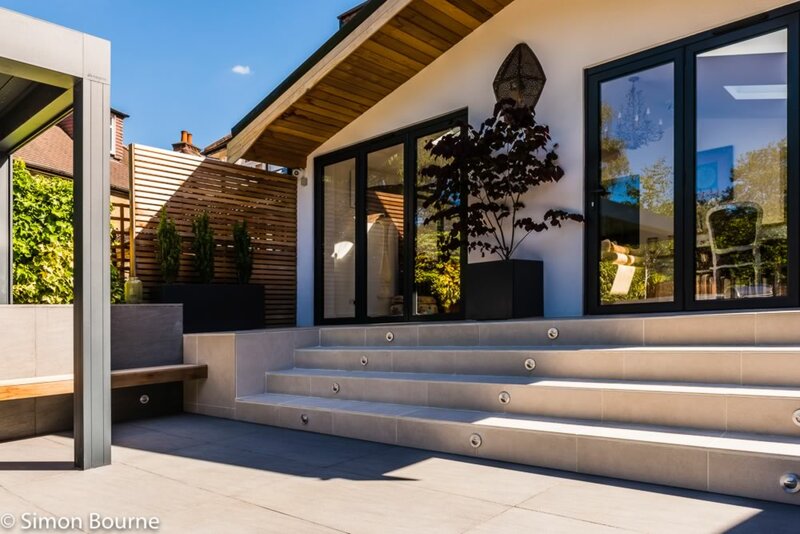 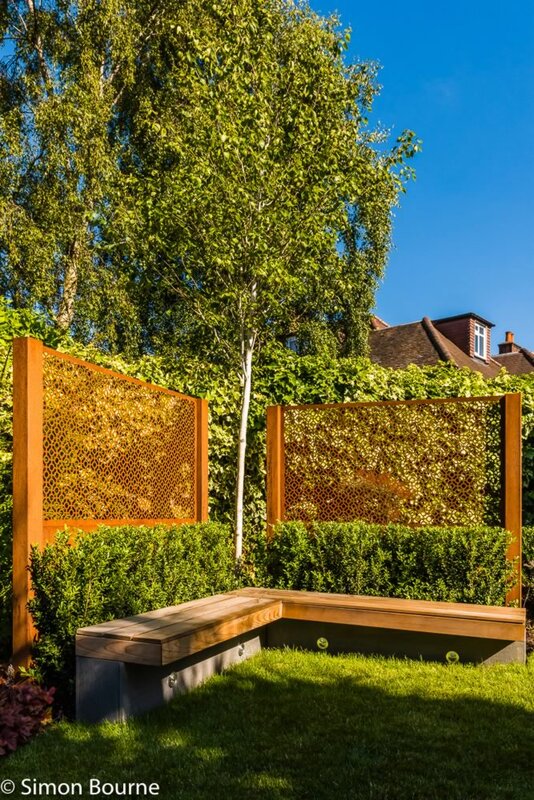 The project had many delays for various reasons but quiet determination wins the day and both I, the client and the landscaper are very happy with the outcome which has been affirmed by winning a prestigious BALI Award. 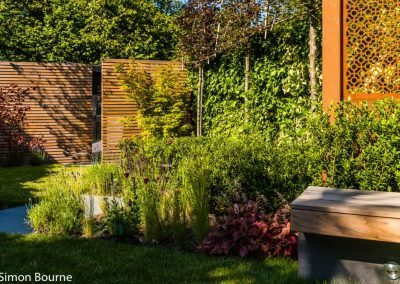 A diagonal design afforded the best use of space for this rather tricky triangular shaped back garden with level change. The main patio space included in-built seating, patio shade, fire pit, water feature with enough space to add another table and chairs when required. 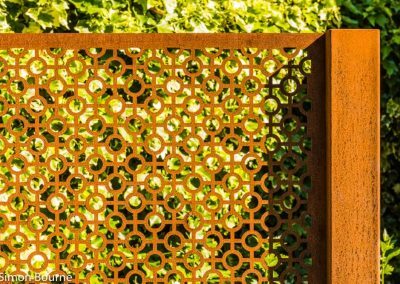 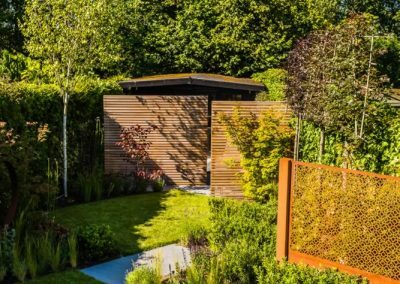 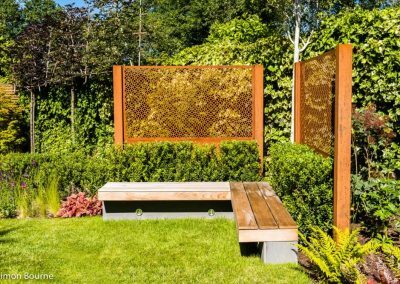 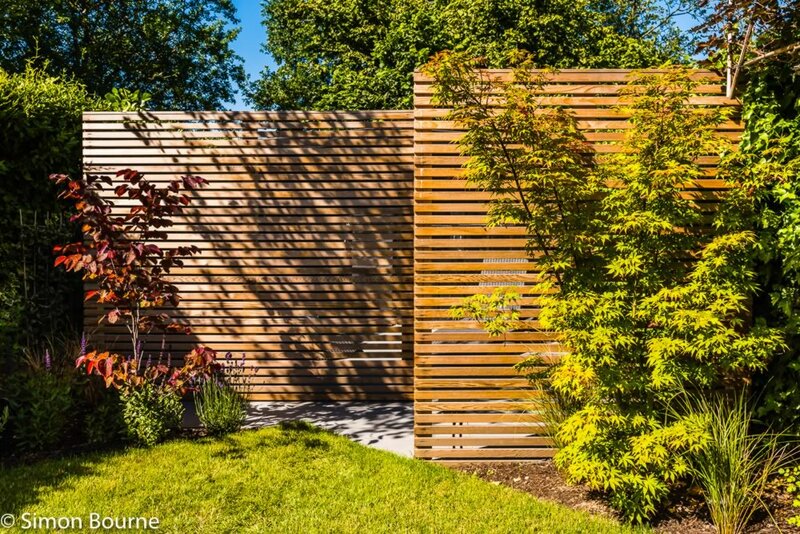 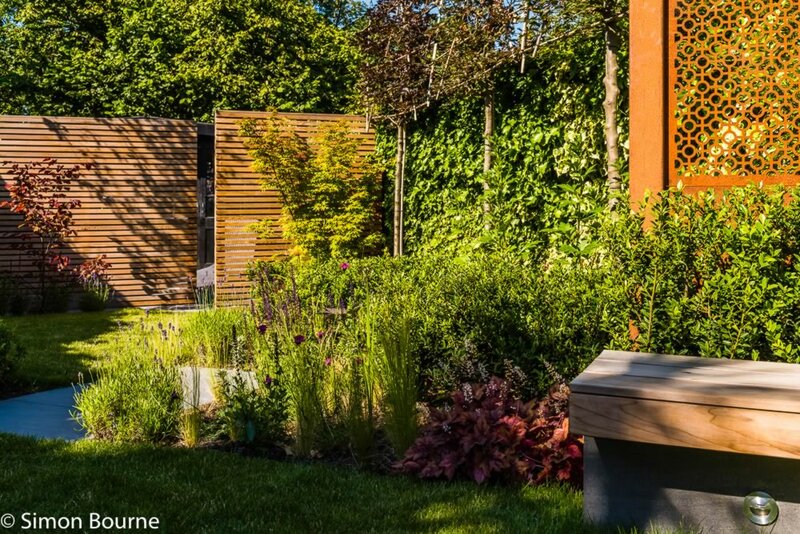 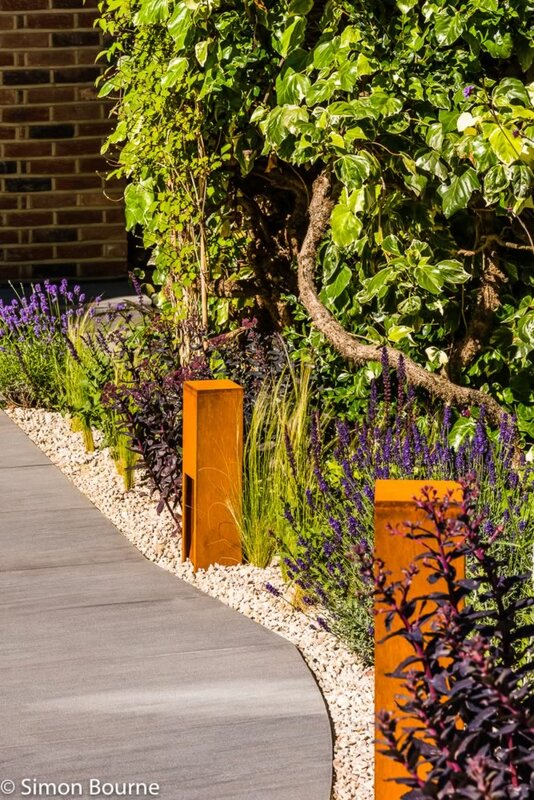 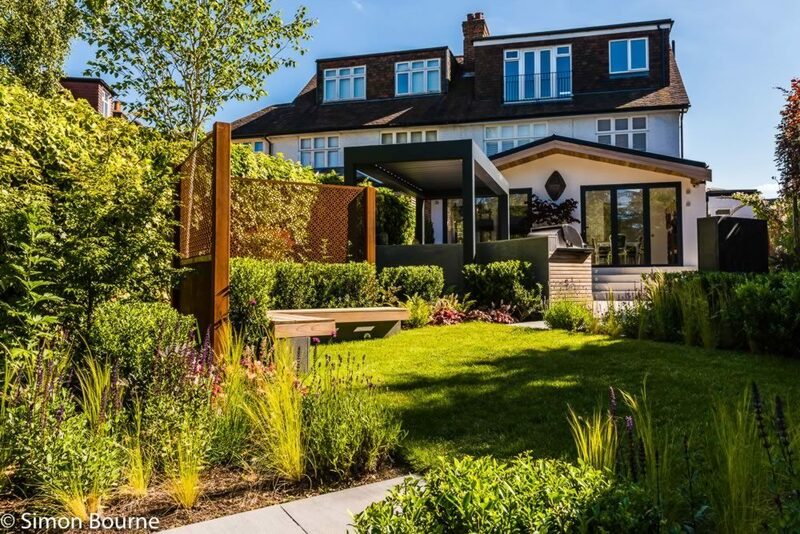 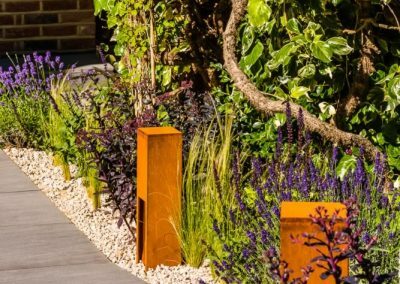 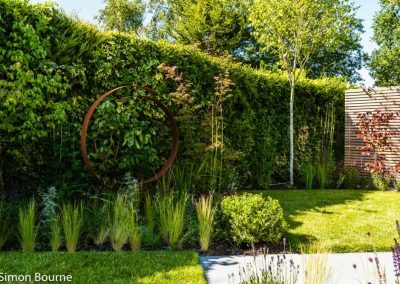 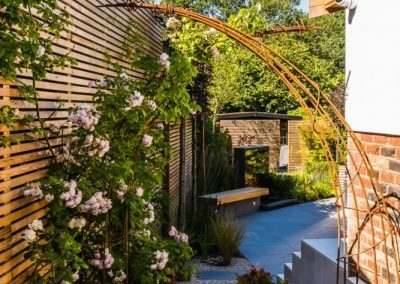 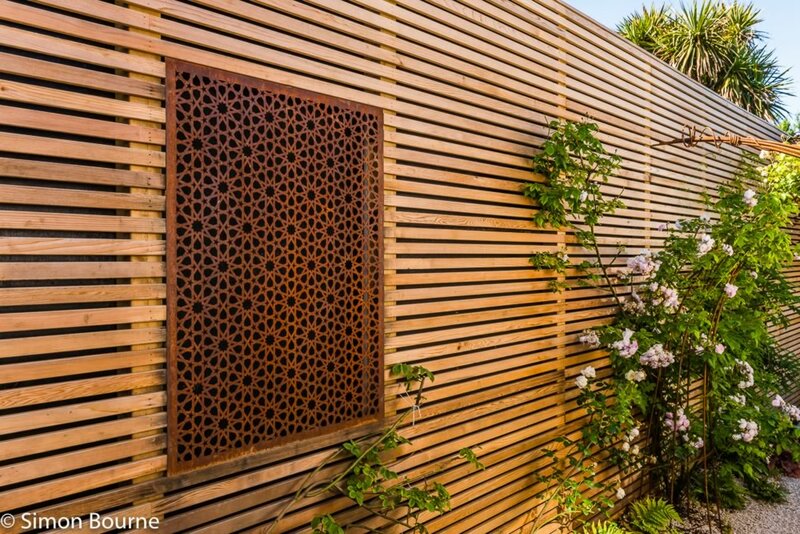 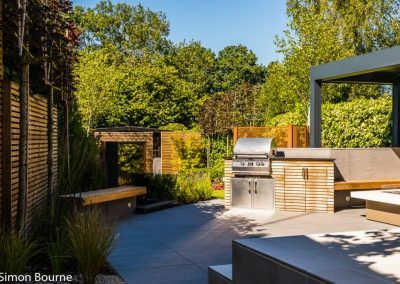 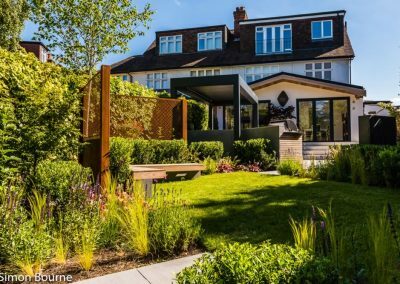 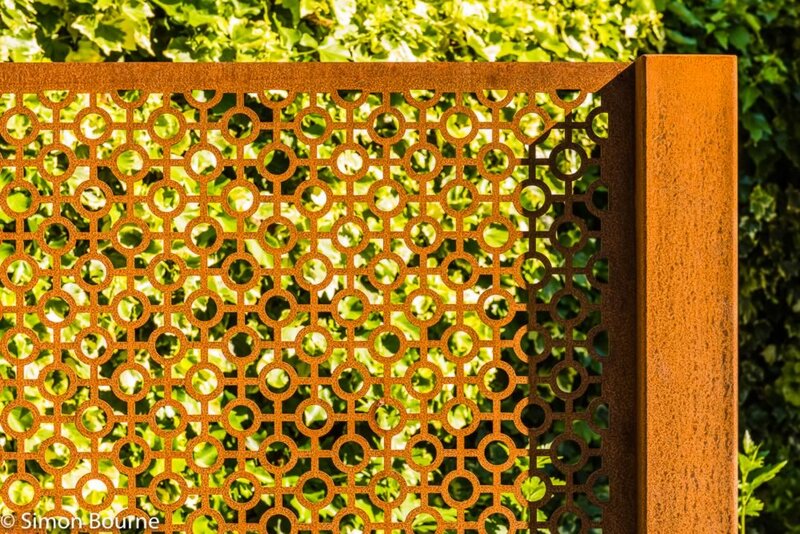 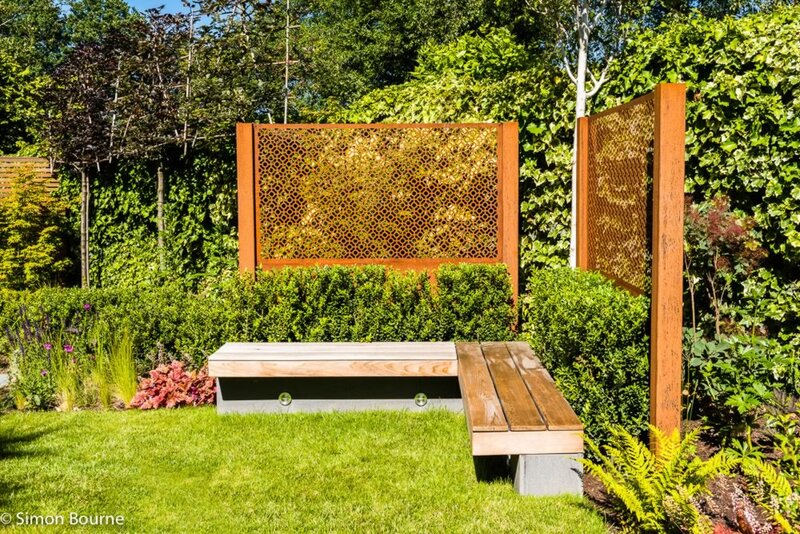 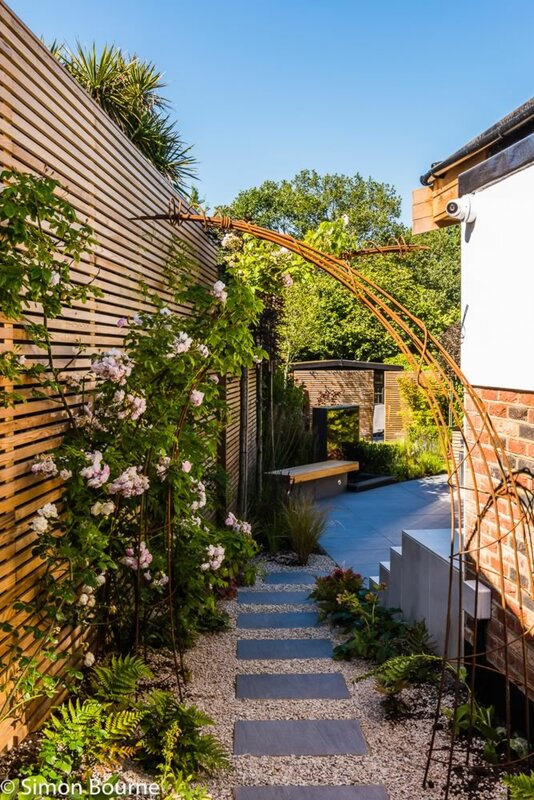 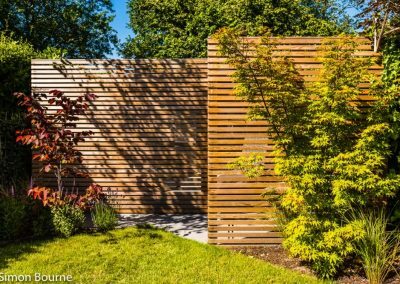 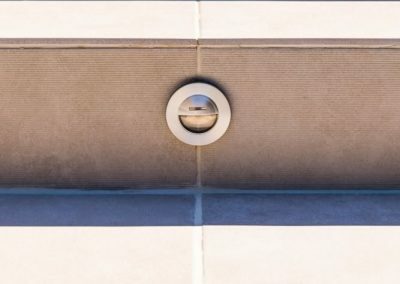 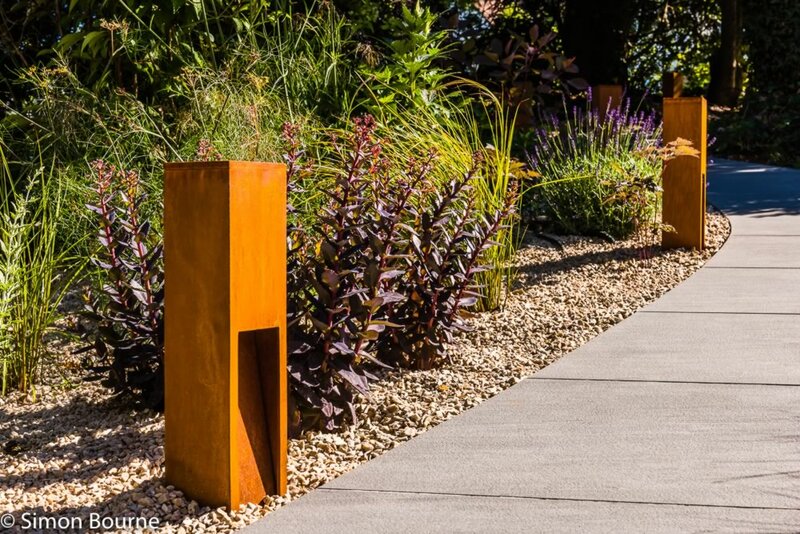 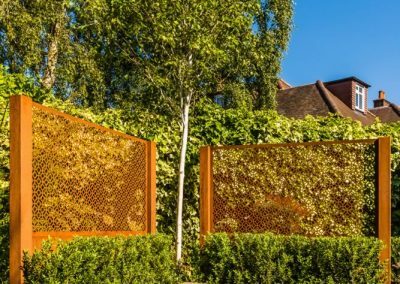 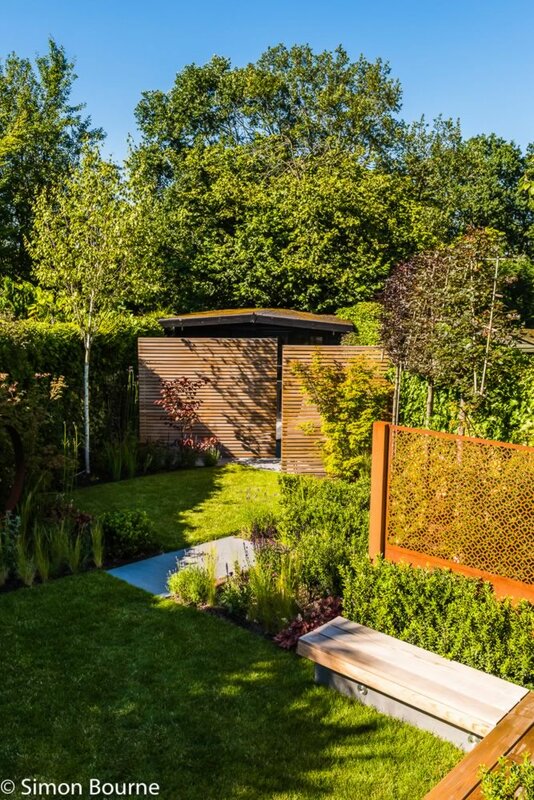 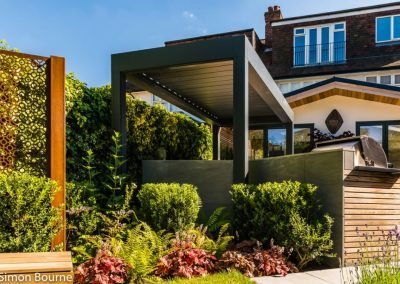 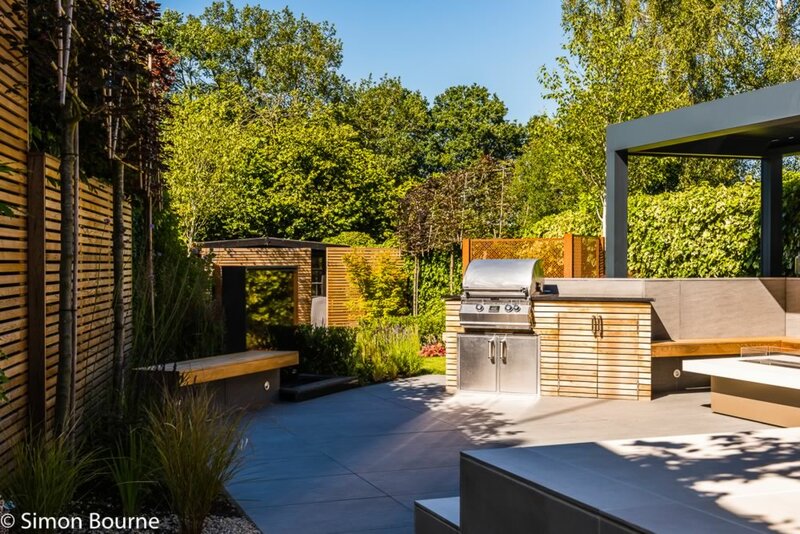 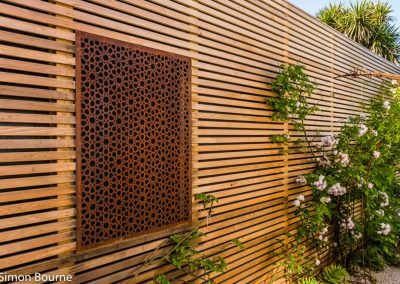 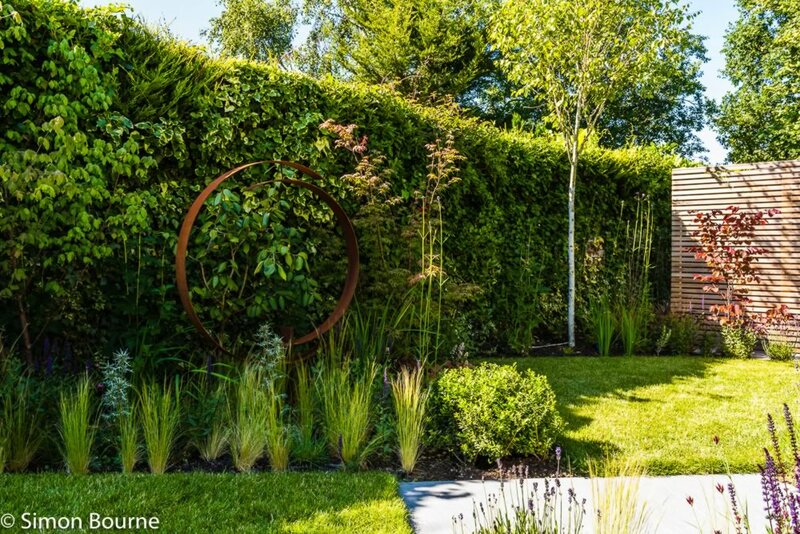 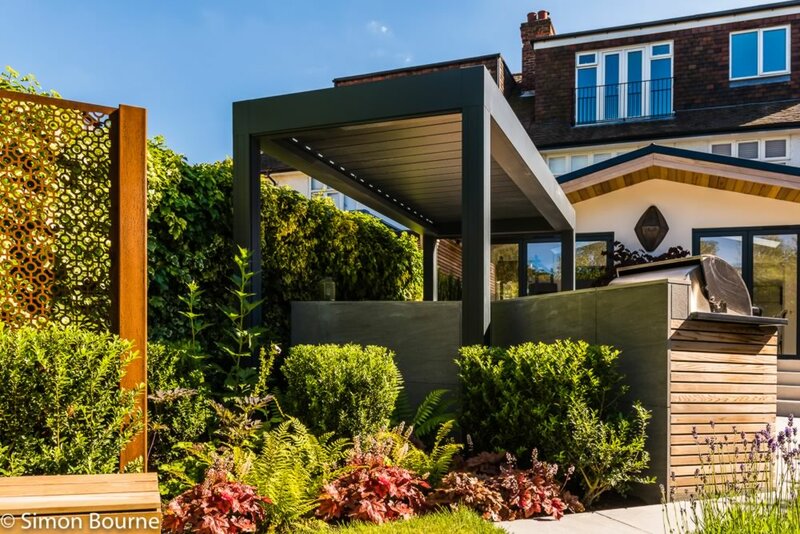 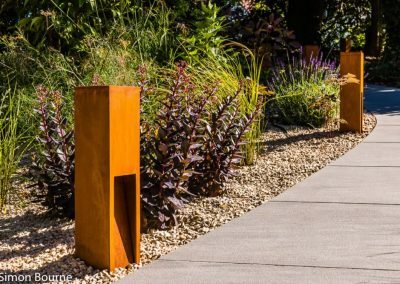 Contemporary and slick hard landscaping materials were used to create a sharp edged layout which were embellished with corten steel screens and sculpture. 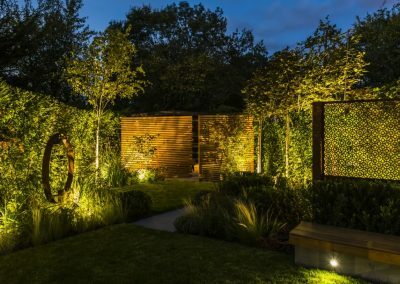 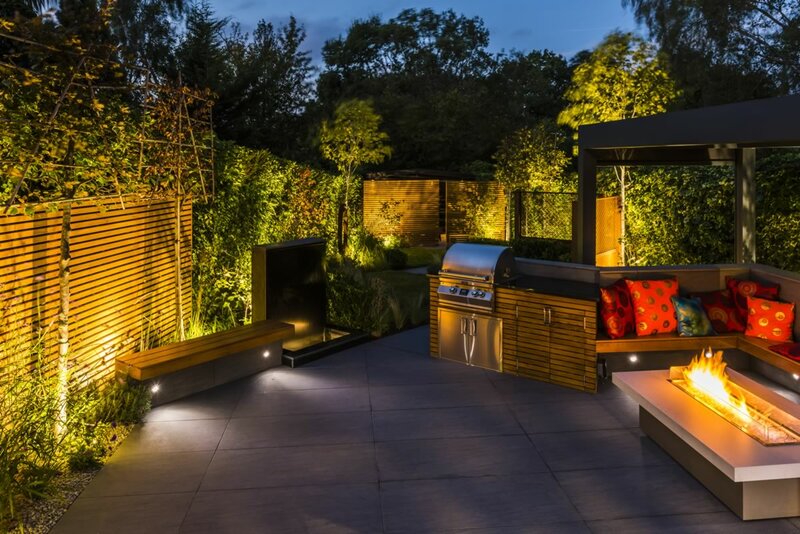 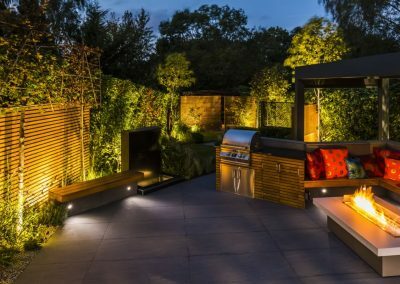 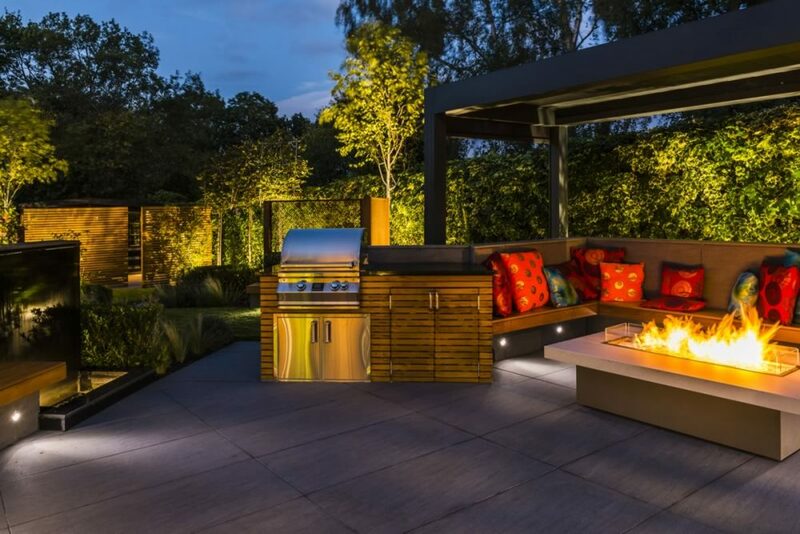 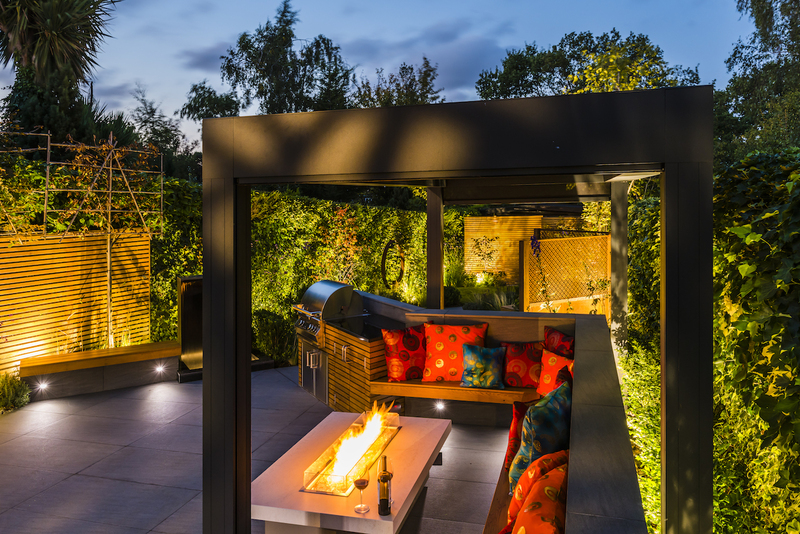 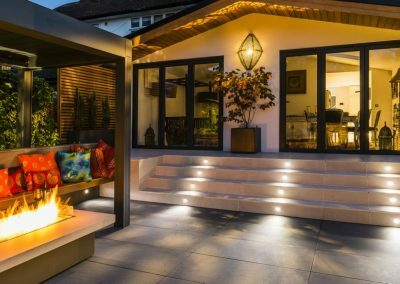 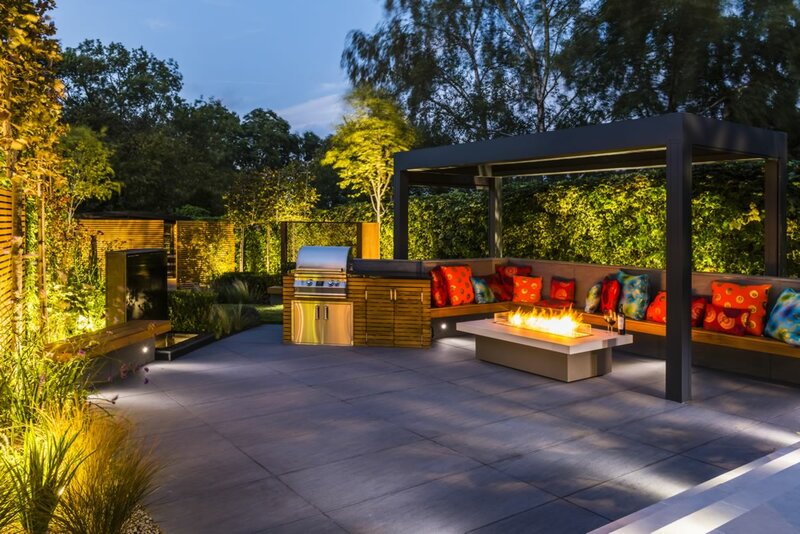 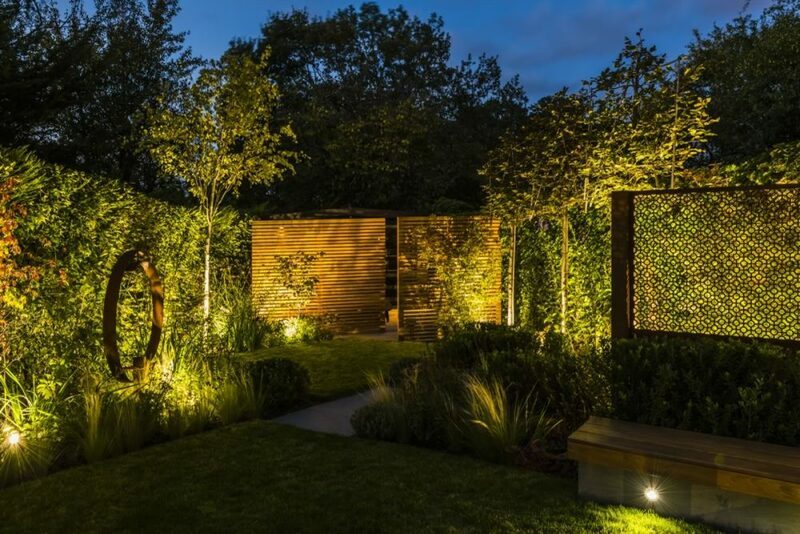 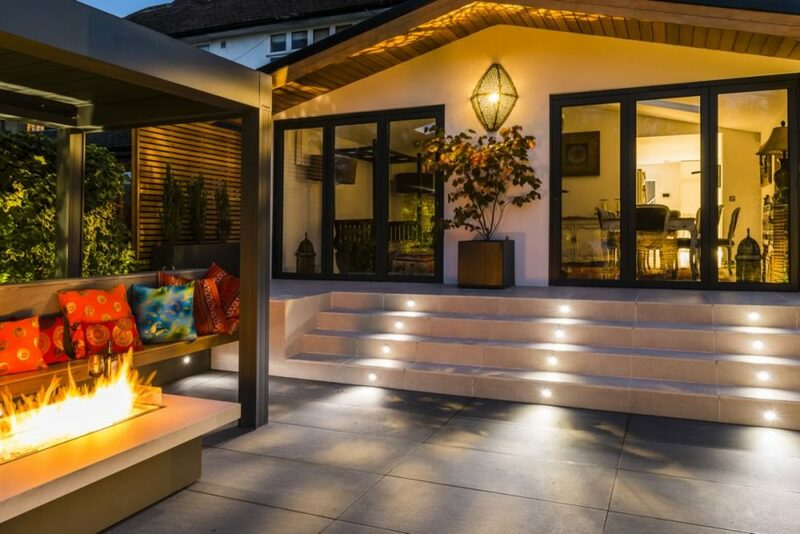 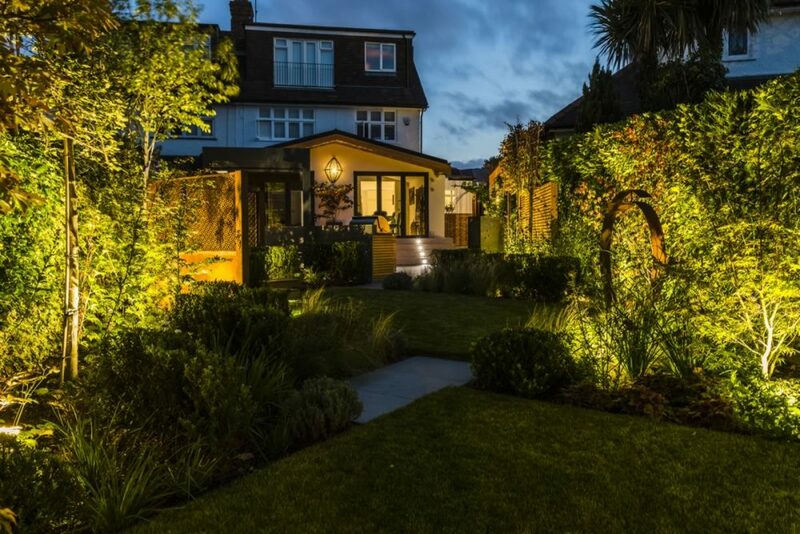 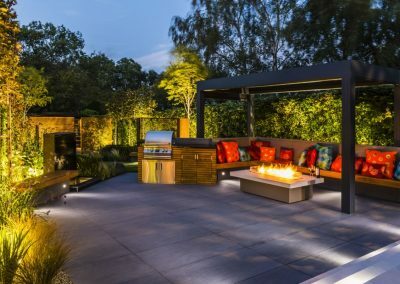 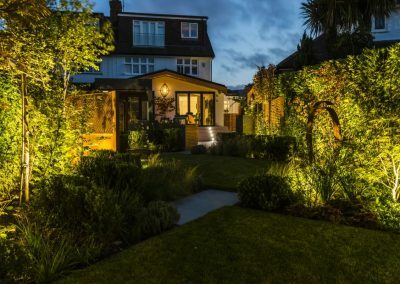 The garden changes quite dramatically in the dark when the lighting system creates an intimate and enchanting atmosphere which the clients have enjoyed enormously. 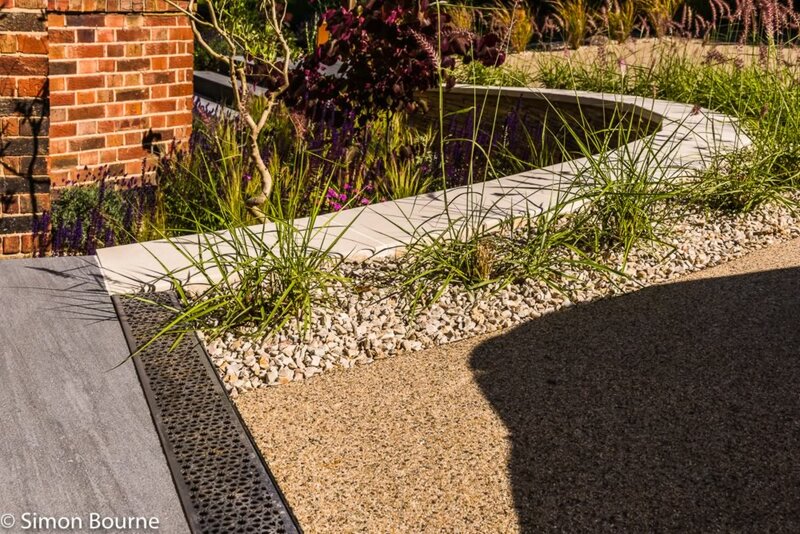 The front garden incorporated parking for two cars and the sloping site needed some consideration. 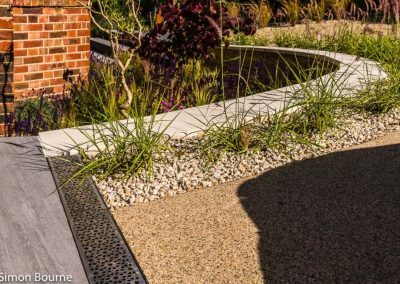 I replicated the same materials from the back garden as much as possible for continuity and installed a resin bound driveway with colours to blend in with the rest of the hardscape. 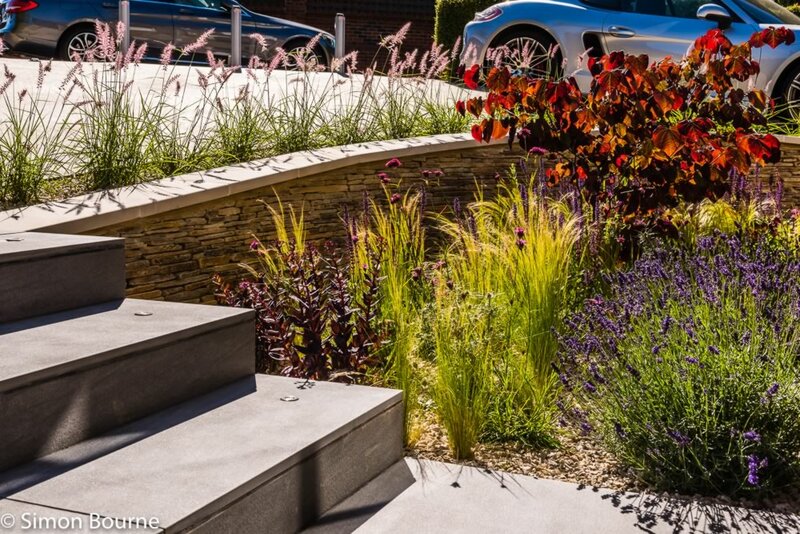 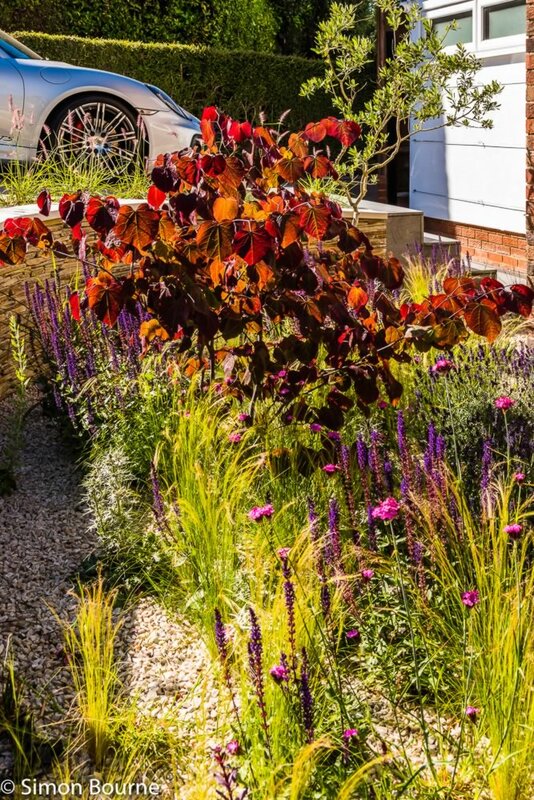 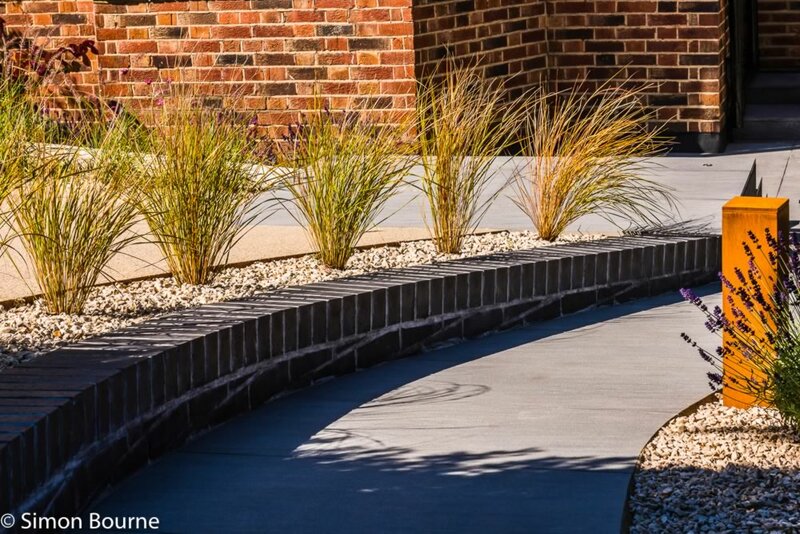 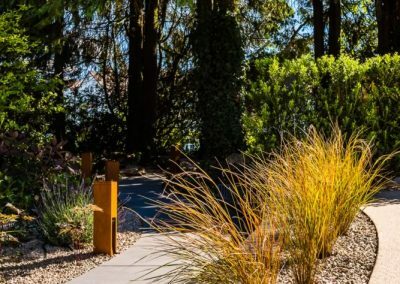 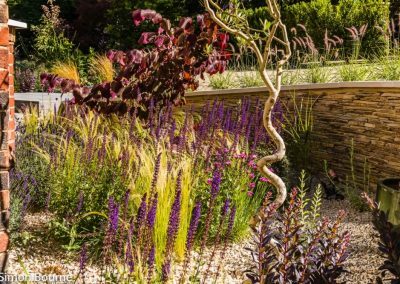 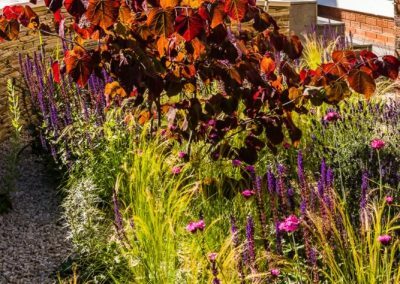 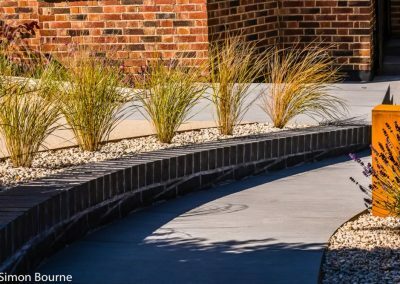 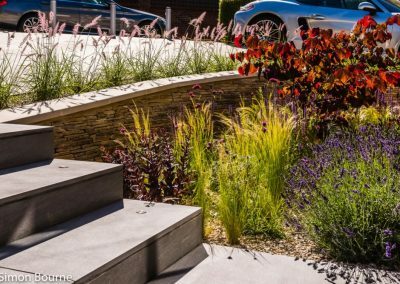 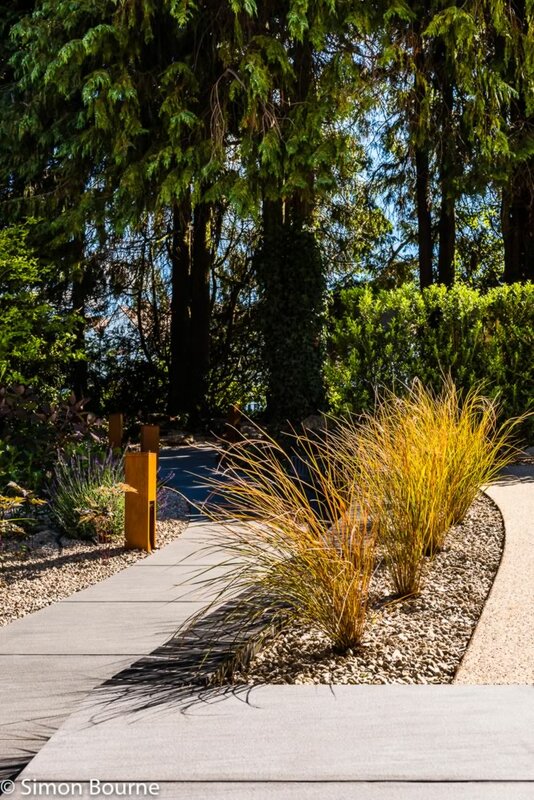 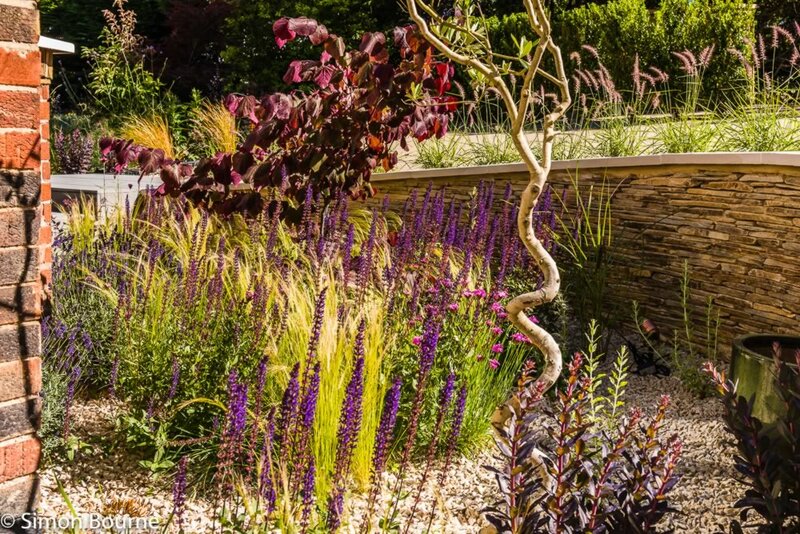 The planting throughout back and front gardens has strong structural elements which are softened by naturalistic planting using soft grasses and flowering perennials for year round interest.